I bought this pink faux suede polyester fabric in Nippori fabric district in Tokyo when Carolyn and Cassie were spending time with me during their holiday in Japan in January. I thought that very simple blouses in such suede fabrics would be unusual, but at the same time they could be very pretty too. So I decided that one small piece of this pink fabric was my catch of the day. I remember I returned home with a big happy grin, knowing it would bring an experimental fun project. Although I've made some bags with those faux suede fabrics before(1, 2, 3), this was the first time for me to make a garment with this specific material. I really wasn't sure if the result would be wearable, and it took awhile for me to be enough courageous about the blouse. But you know, you will see how things turn out only after trying them actually for yourself. 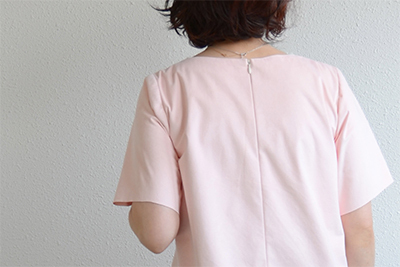 After all, sewing this blouse was easy-peasy and the result looks not bad at all, to my eyes. I washed the fabric before and also after sewing, and found that there was no problem or shape-changing with soaking the fabric in the water. Now you can agree with me in the safe side that this is a wearable garment, can't you. 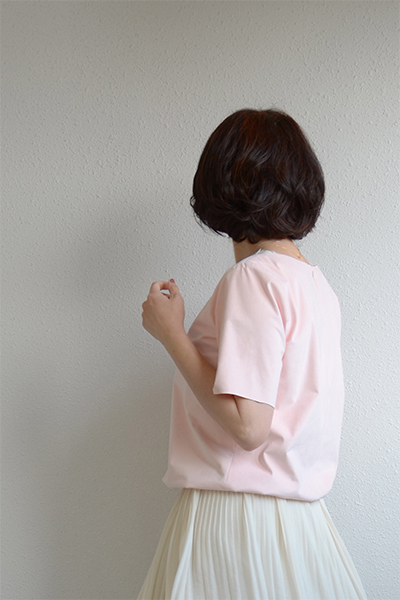 I used Grainline Studio's Scout Woven Tee pattern for this blouse. I chose one larger size for my measurement except shoulders that were in my usual size. As the fabric had little flexibility, I think I did very right about the size. 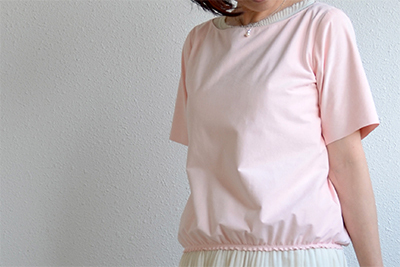 An elastic band was inserted the inside of the bottom hem with zig-zag stitches to get a slight blousing effect, and it makes the wearer looking wearing something soft and balloon-ish and I think it is kinda cute. I altered the neckline to a boat neck and added an invisible zipper in the back center from the top to the halfway down, too. I can put it on and off without the zipper operation, if I tell you the truth, but you really don't have to point it out loud as only garments that have harmless imperfections can be interesting in the squirrelly world, for sure. I hope you're having a good week!! Congrats, the giveaway winner is lorrwill who was the 45th commentator!! 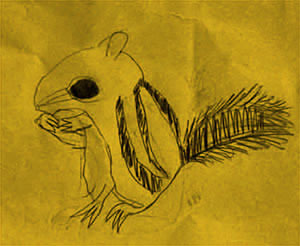 Last week, that flying squirrel appeared from nowhere, and squeaked at me "Give it away!" all after one year. By that I realized V-day was coming around the corner and I had to be ready for another giveaway announcement before too late (I was late in the last year, but it was the squirrel's fault). In case you are not familiar with this habit of my blog, I tell you that throwing Valentine giveaway posts is the only and the most important annual project in this tiny blog. 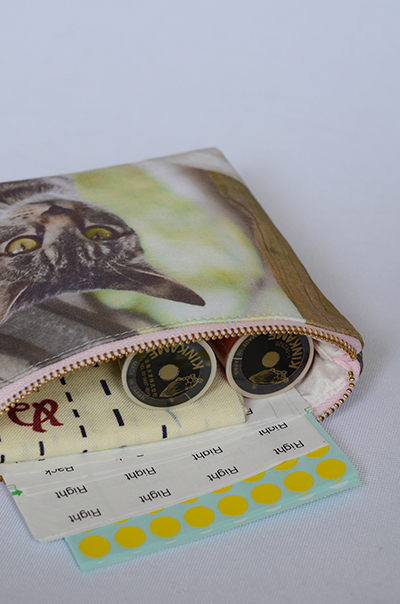 This year, I made a small pouch and stuffed it with some sewing-related miscellaneous goodies as the giveaway prize. If you are interested in winning the prize, please leave your comment here and also share your story of your current project(s) with us if there is any! I'll pick up one winner after closing the comment section and let you know the winner's name in the next blog post. I hope you are going to enter the draw and enjoy the game. 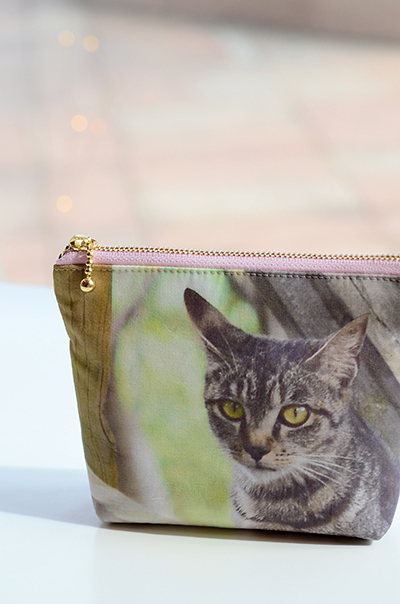 I printed one of my favorite photographs that I took in the last year for my other blog "photo maisonette" on a cotton fabric, and sewed a small pouch with the fabric. 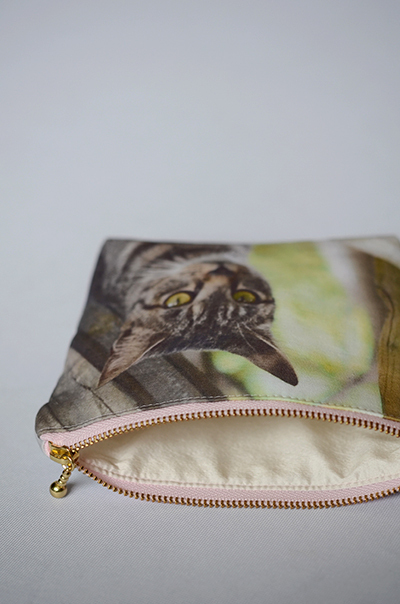 It is a palm-sized simple pouch and the print is of course water proof (I mean, washable). Zipper opening applied, silk dupioni lined, lightly padded. I met the cat in the forest. It is a cute thing and I hope it is enough photogenic to everyone. 1. My favorite "Kinkame Beauty" threads in two colors (salmon pink and grass green). Do you have particular brand of threads of your favorite? I love these and I cannot replace them with other brands. They're plainly some polyester threads, though, they're made from continuous(longer) filaments of polyester fibers and have a different texture from the ones the common spun threads have. Spun threads are usually made from staple(shorter) fibers and are less lustrous than these "core threads (single core wrapped around by longer filamentous fiber, I guess)". So far as I feel, they make seams suppler and slinkier, and thus the feminine garments get better looks with them. I know most of you don't believe me, because many didn't. But if you're interested, please take a chance and enter the draw to get them and see how you think. 2. 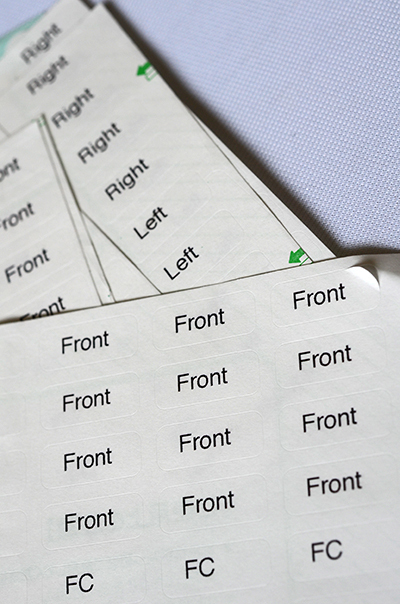 Pre-printed tiny stickers for piece identification. The last one is a small piece of handkerchief with a print of hand stitches, which is made of double gauze. It is particularly useful for covering small pieces of delicate fashion fabrics while ironing and fusing interfacings. I always have one of them on my sewing table when I work on my projects, and usually finish each sewing session by wiping all over with it for cleaning fluff stuff around the space. And then all I have to do is throwing it into the laundry bin. Easy! Anyone who is interested in winning the prize, please leave your comment below! Your story of current project(s) in the comment will be much appreciated(I love your stories). I am going to close the comment box at noon on 17th(JST=UTC+9) February (Mon) and will pick one winner by random drawing. Anybody in any area on our planet can be involved in this draw. You don't particularly need to disclose your e-mail address to me for entering the draw, however, please do not forget to leave your name, otherwise you may not be included in the draw. I will announce the recipient of the gift in the next blog post, so, please come and check to see whether you have won the prize or not. If the person who was chosen in the first place seemed not to respond to the winner announcement, the second drawing will choose one new winner and the first winning will be cancelled, and so on. Happy sewing and happy socializing! I'm so ready for sewing lighter garments for spring. Looking at outside snowing, I've sewn a pullover and a skirt, already. One day, I was very optimistic and I couldn't avoid an experiment that I wouldn't normally try on my own garments. It was color-blocking, and hahaha, you can see what I have done. I think it ended up Okay and I quite enjoy wearing it when I especially like to dress casual. The gray jersey fabric is shiny and shaggy, and is a good contrast to the white jersey fabric that has a soft and spongy texture. It was hard to photograph the garment with showing its good characters rightly, though, you might be able to feel that I'm pleased with this tiny sewing adventure. The pattern was Edelweiss from Tamanegi-kobo. By the way, I tell you that Edelweiss is one of my best staple patterns. It is so versatile and pretty! Having talked about Tamanegi-kobo, I let you know that they have moved to the new site for renewal opening very recently. 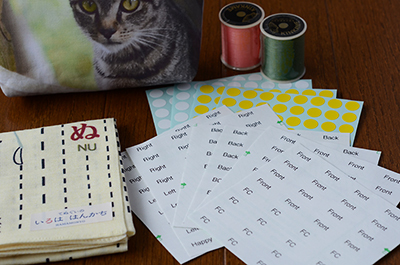 The new shop now perfectly supports two languages, Japanese and English, and the patterns are instant download upon purchase. Yay! Even their patterns got huge improvements in many aspects too, for instance, the way of page placement and multi-size layering of the newly released PDF patterns seems even better. Moreover, and also what might be better for you, they have decided to provide some oldest patterns free of charge. The newly free patterns are limited to the ones that are nested PDF without individual layers for each size, nevertheless, I think it is a big surprise. If you are curious about using my favorite pattern shop's patterns, now is the time to try. By the way, the pattern Balloon which I wrote about in this blog post is now one of their free patterns too. I got another fabric while they were here too, and I made this skirt using it. As you may be guessing, Carolyn kindly brought me this beautiful Aboriginal print fabric as a gift. I am such a lucky woman. I always think that I am, but I really mean it when I think of my sewing friends. You all are gems in my life, and you make me feel that I'd love to be a nice person like you and others. Thank you so much, Carolyn, the Fish Basket fabric turned out a pretty skirt and the color suits my wardrobe very much! This is a simple skirt with asymmetric but conservative ruffles. The pattern is from Annee-patterns and its name is Daisy. I didn't put many alterations to the pattern but lengthened a bit to fit my height. I like this feminine skirt, and I'm sure it's going to appear on many warm days in the future. Not much altered except color blocking. jerseys with medium body. White and gray. Plain woven cotton with Aboriginal print "Fish Basket". fairly firm, drapes not bad, gray, white, black and yellow.